1 FREE Bamboo Nursing Pads! (Trial Pack includes a Pea Pod, Night Booster and Bamboo liners... all packaged in a BONUS Wet Bag! ... all packaged in a BONUS Wet Bag! 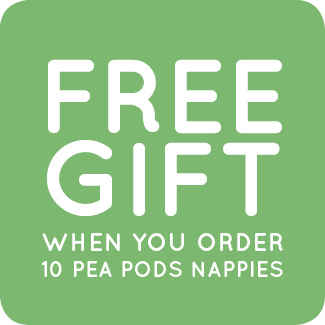 "I have used Pea Pods for both of my girls (now 2 & 1) & even the first nappies I purchased are still going strong wash after wash. The new one-sized nappies are the best yet & I especially love the adjustable leg elastic, which is a unique feature to other "one-sized" nappies, they are also much simpler to use, less bulky and are very reasonably priced. They come in lots of fun colours to suit the outfit or the mood (I especially love the red ones)! I have & will continue to recommend them to any new mum looking for a reliable reusable nappy". “I love the Pea Pods products. I have about 10 nappies, use the bamboo wipes and swear by the bamboo liners. My nappies that I used for number 1 bub are still in perfect condition for number 2 bub who I had recently”. Ohmygosh these nappies are incredible! I bought 20 at the baby show last year and have only just started using them 24/7 on my 5 month old. I thought I'd only ever use them at home during the day because disposables were easier being out and about...but last week I decided to give pea pods a go. I absolutely love them...and the waterproof bags make it so much easier to just chuck them in my nappy bag. I can't get over that the bags don't leak any smell at all!! I also started using the nappies at night...I am totally converted...no more disposables going forward &#9786; ooo and one more win for these nappies...they hold the poos in so much better than disposables too. Thanks so much for making incredible quality nappies!